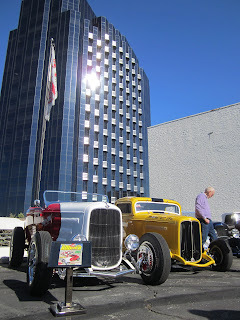 Recent travels brought me to Oklahoma City before returning to California for the Deuce Day Show at the Petersen and the March Pomona Swap Meet. 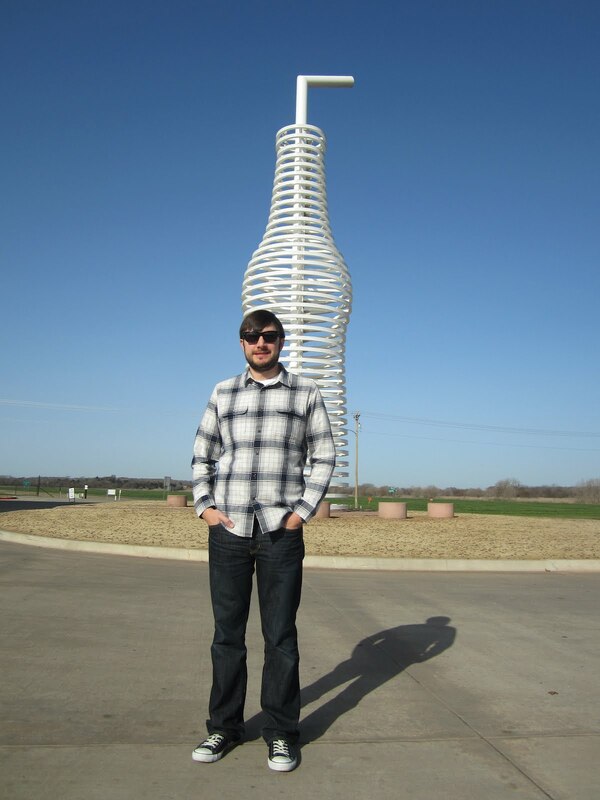 I traveled to Oklahoma with our Sales Manager to meet some customers and suppliers last week. After a few days of business meetings we had a couple hours to detour before catching our flight back to Los Angeles. 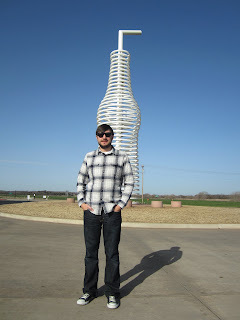 Our first stop was Pop's Soda Shop on Route 66 just outside of Oklahoma City. 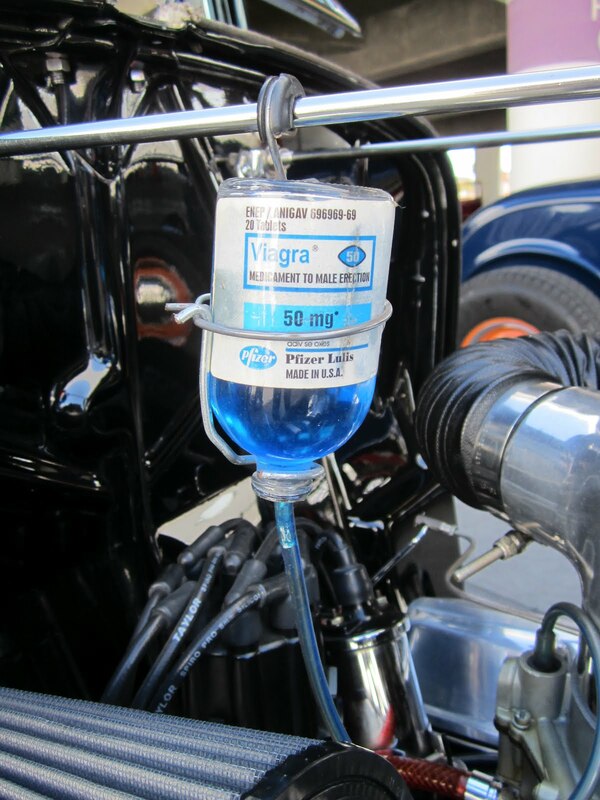 Pop's is not just another gas station. 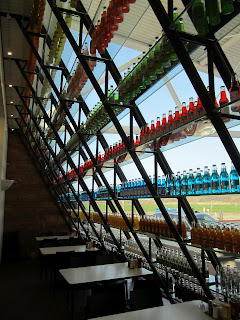 It is coffee shop, gift shop and home to a collection of 500+ different sodas on any given day. 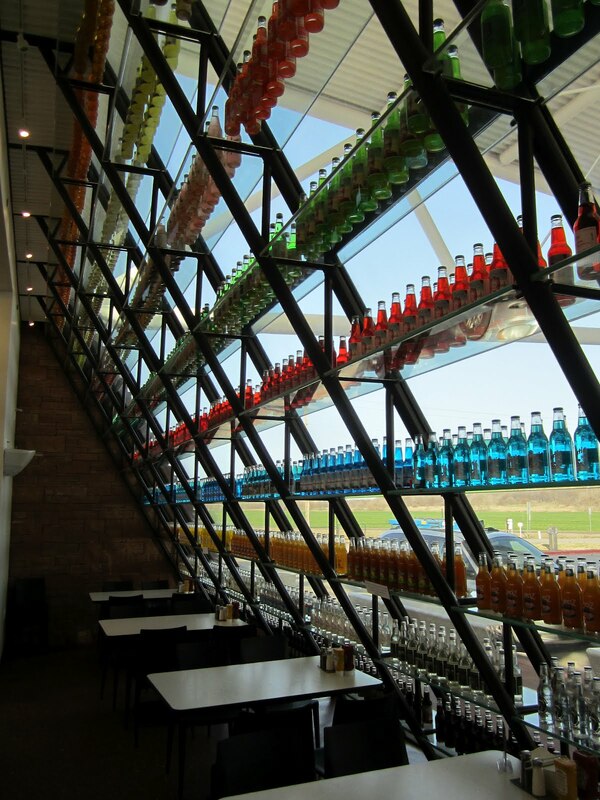 You can't miss the giant soda bottle out front either. I opted for a Dublin Dr. Pepper, but there were many unique options you cannot find just anywhere. Sweet corn or buffalo wing flavored soda, anyone? 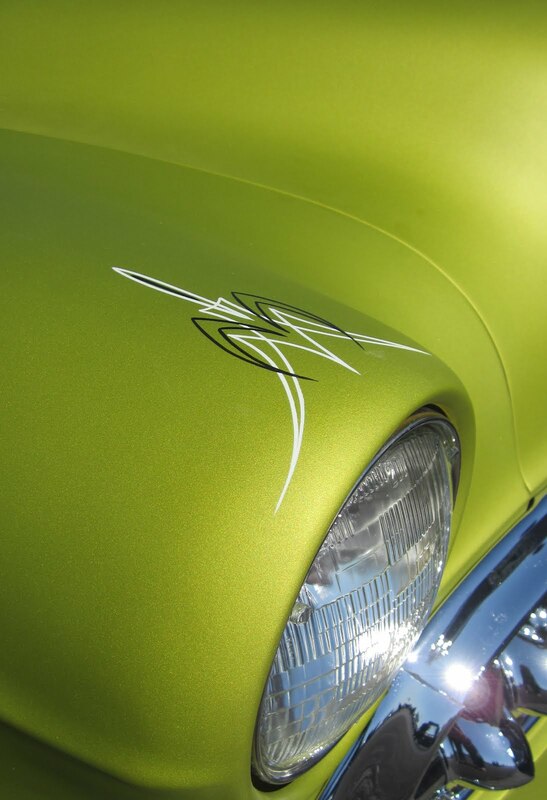 Then it was time to head back to OKC for the start of the Oklahoma International Auto Show. It was not a huge event like the LA Auto Show, but there was a nice exhibit of cars from the early 1900s, plus a hall full of classic cars. This Benz only cost $725 back in 1885. For lunch we stopped by Nic's Grill. 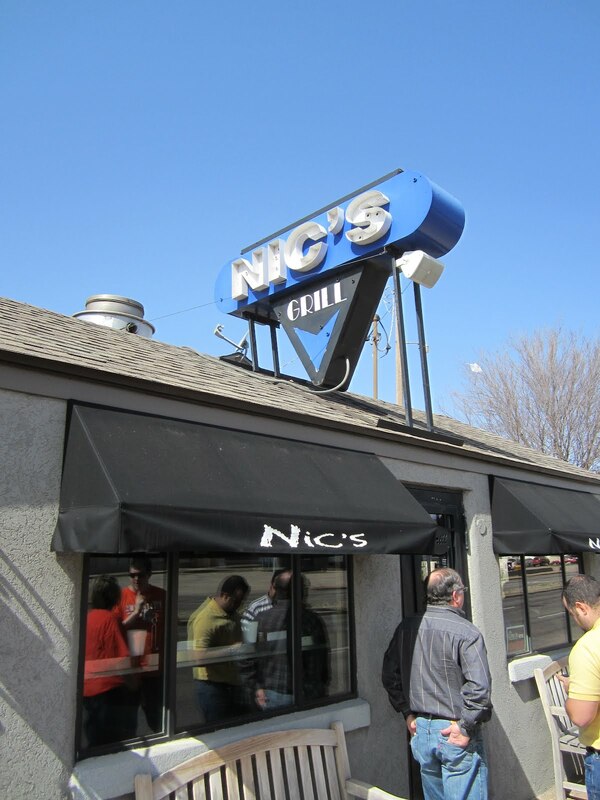 This mini burger joint has become an OKC landmark. We were happy that the place was just around the corner from the fairgrounds and line was not too long. The burgers were definitely worth the wait. After a a few days back at California Car Cover, it was another double show weekend. 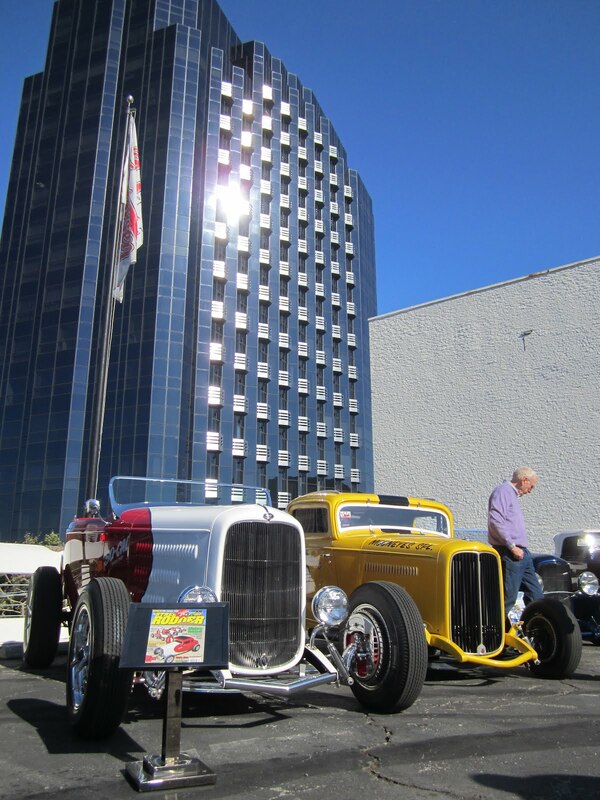 On Saturday, I was working at the Deuce Day Show at the Petersen Museum with our Sales Manager, Brian. If you are a fan of 1932 Fords this show was the place to be on Saturday. 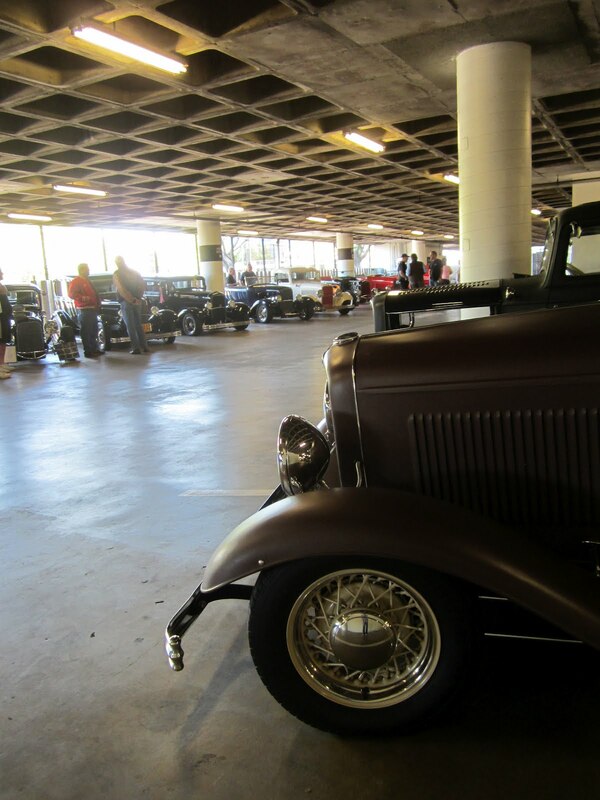 About 300 '32s filled the parking structure of the museum. I was happy to see a few street rods still had covers on them when I arrived. 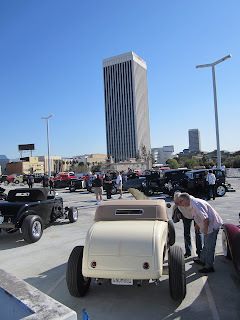 The show was held at the Petersen Museum, along the famous Miracle Mile in Los Angeles. This barn find 1932 Ford was on display at the show. 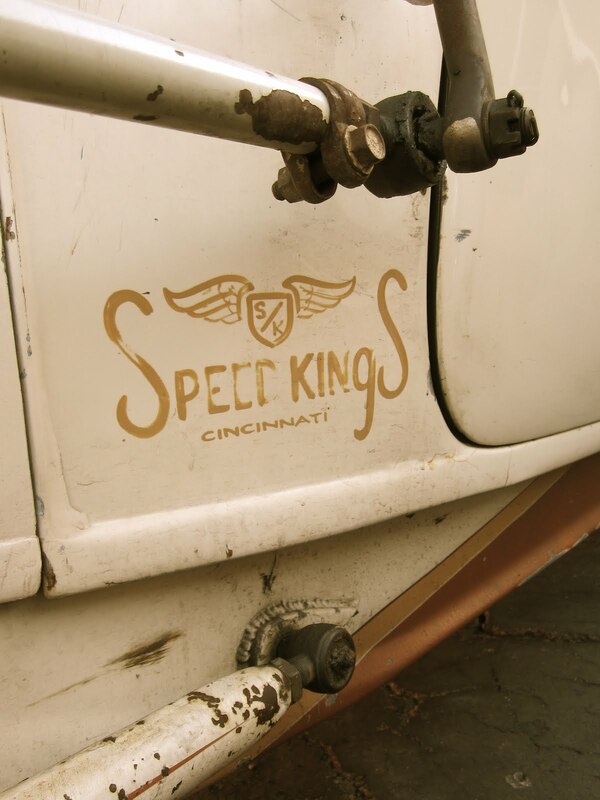 It was a daily driver for many years in the early 3os, but had been found in storage earlier this year. 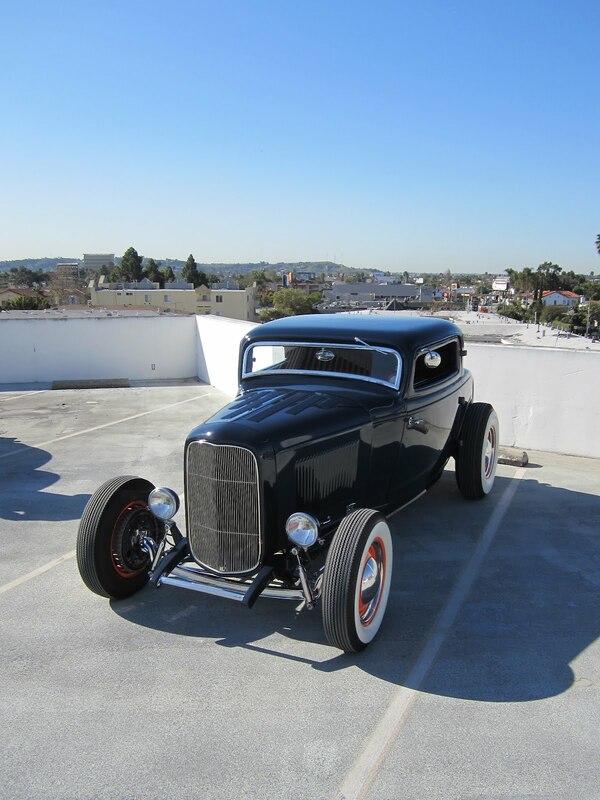 Petersen Museum Parking Lot Roof Top. 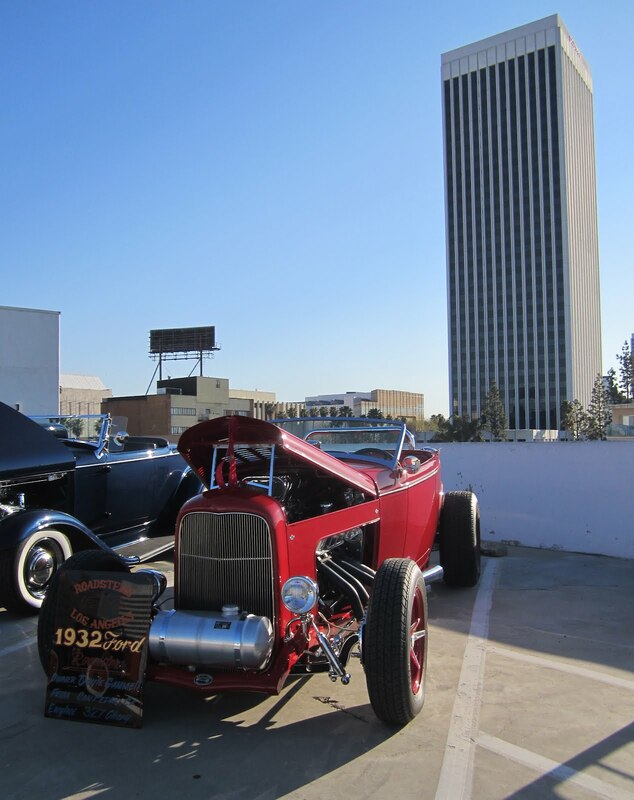 My father (The guy in the red L.A. Roadsters Jacket) and some of his friends from the club drove their '32s out to the event as well. 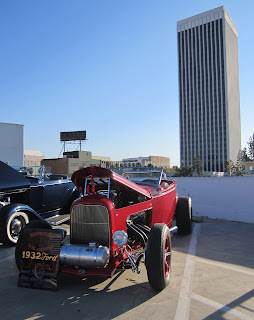 All four levels of the parking structure had a variety of cars on display. Just outside the museum is where a lot of the action was all day. Many media companies were on hand to film and take photos of vehicles for magazine coverage. There were also some funny touches on some cars at the show... In case someone at the show tried to get crazy and drive off in a '32. 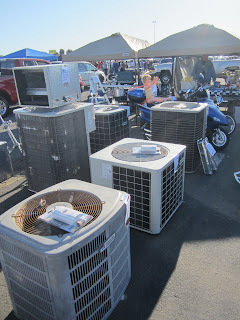 The next morning the California Car Cover crew and I were out in Pomona for the auto swap meet. The weather was great and the place was packed. You will see from the photos that there were people everywhere on Sunday. On my breaks from the booth I took some photos of the unique and interesting sights from the swap meet because you never know what you will stumble upon at the Pomona Swap Meet. Need an A/C unit for your house? How about a scooter? How about a weird mannequin? The For Sale section had plenty of classic cars on display. Cars and canopies as far you could see. It was a event filled weekend. 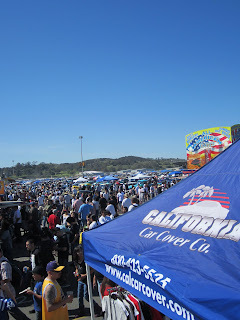 For the next few weeks I will be attending local shows and sites so check back for unique news and notes from California Car Cover.